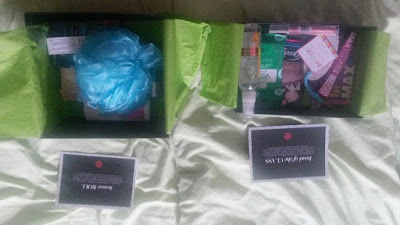 Disclaimer: I purchased both boxes and all my comments are my own on my blog!! Let's start with Head of the Class Target Box!! I love Goody Ouchless Elastics for my medium-long relaxed hair esp during the summer heat and humidy in which a pony tail comes in handy during workouts and errands! Plus in several colors including PINK I love this choose! I love the Bathery Pumice Stone for use in the shower which is braided rope to hang after giving my feet a gentle buff !! I love Hollywood Fashion Tape to keep my summer wardrobe from not failing me!! Did not like the Peachy/Golden gloss from CoverGirl so I gave it to one of my sister who loved it! Also I did not like receiving Wet N Wild mascara...I know which brands work for me and its not this brand so I also gave it away! I love the glossy but not greasy shine that Herbal Essence Wild Naturals Dry Oil Spray worked on my relaxed dark hair!! And I love refreshingly cool cumber scent of the Yes Wipes on my face plus did a wonderful job on removing my makeup! I rate this box "5 out of 7" which means I love five items out of the seven items that I received in my Head of the Class Target Box!!! And now the Honor Roll Target Box!! I love the blue Bathery Delicate Pouf in the shower alot with the irresistible scent of Olay White Strawberry Body Wash in the shower on my dry skin!! Sadly, I have no need of extra volume to use the 7-Day Treatment from John Frieda...I need frizz or definition control with my relaxed hair which is showing signs of my natural volume!! Got more Goodies Ouchless Elastics which I love!! I love the NYX Butter Gloss in Strawberry Parfait on my dry lips which gave them extra conditioning!! Love the CoverGirl Outlast All-Day Primer which dissolve in my medium-tone skin without white residue which I was so glad!! Burt's Bee White Tea wipes was excellent on removing makeup off my face!! I rate this box " 6 out of 7" which means I love six items out of the seven items that I received in my Honor Roll Target Box!! Added bonuses to both boxes is a coupon for $3 off Beauty purchases of $15 or more which comes in handy for Back to School essentials for Cosmetics, Skin care, and Hair care!! Ursula aka Blueridge Beauty Blogger!! These boxes were awesome for $5 each. Both of these boxes looked good! I couldn't justify spending more money since I got Ipsy and Birchbox this month, but if I had to pick one, I would get the Honor Roll box for the NYX and the Burt's Bees! I love the NYX and the Burt Bees!! I love simple makeup routines during extreme heat!! How do you get these? Is it like a subscription service but they only have limited quantities? That is a lot of goodies for only $5! I love primers and I want to try the Covergirl Outlast one. Any other thoughts on it? Sadly its not a subscription service but a "First Come, First Serve" basis which is why they SOLD OUT! There is a new Target Box right now so go check it out and hopefully you can try it out! These Back to School theme boxes has all the essentials for beauty/skin/hair for ladies!! Yes I did...I can't wait to try the Hair Condition and the whitening strips (about time for me)!! What!!! It makes me jealous that target left Canada lol, this is pretty awesome!! That is so sad about Target leaving Canada!! They should allow ordering online to you, sorta like Amazon! I missed this one but it looks like there is a TON of goodies in here! Great bonus on the coupon, too! I think I would have liked the Honor Roll Box the best. I love that they clarify for skin, hair, and beauty for the coupon usage! I got both of these as well and loved them both! I always snag Target Beauty Boxes when I can because they're such a great value and so affordable compared to other beauty boxes out there! I hope they keep it up and maybe can be a subscription with the options of cancel this month feature!! I have no idea but there are shops that I would love to check out in the UK that are not here in the US!! I am waiting for my next box which has a full size conditioner in it! !